"Water is a resource that does not belong to any particular nation or sect. Instead of being used as a tool in a nationalist conflict, water could – and should – be utilized as a means of cooperation and a tool for coexistence." The Daryan Dam is a large dam currently under construction on the Sirwan River, located in Kermanshah Province of Iranian Kurdistan, 28.5 km from the Iraqi border. The government of Iran, who is promoting the project, says the dam is built for the purpose of producing hydroelectric power, as well as for irrigation purposes in southwestern Iran. The project is triggering transboundary conflict in the Kurdistan Region of Iraq (KRI). A series of Iranian dams already exist on the river, which provide hydroelectric power in Iran, but restrict water flows to Iraq. Despite this, currently there is no agreement between Iraq and Iran with regards to the use of the Sirwan/Diyala River. 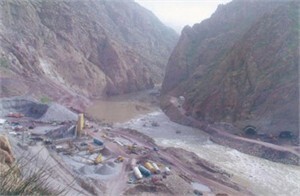 Most of the rivers which run through the KRI emanate from Turkey or Iran, and the potential water crisis will be instigated by large-scale dams outside of the KRI’s borders coming on-stream, primarily the Daryan Dam in Iran, and to a lesser extent the Ilisu Dam in Turkey, both of which are nearing completion. In recent years, the Kurdistan Regional Government (KRG) itself began constructing additional dams, which are viewed as a threat throughout the rest of Iraq. In Baghdad and Erbil alike, nationalist rhetoric is increasing, and water carries great potential to play a significant role in future disputes between the two governments. Controversially, though KRG politicians and civil activists are in opposition of the construction of dams on shared rivers in Turkey and Iran, they support the construction of dams in the KRI in order to control access to water resources flowing to Central and Southern Iraq. To date, there is little literature available on the Daryan Dam, even though its impact on Iraq is huge. The Save the Tigris and Iraqi Marshes Campaign has launched a report on the project from which we learn that there is lots of "controversial construction of dams for purposes of self-interest in a water scarce region despite evidence of their significant negative impact both locally, through displacement, and downstream, through reduced water flows" . The report states that "between 20 to 30 percent of the Tigris River’s annual flow originates in Iran via the Sirwan River and the Alwand River. In recent years, Iranian water projects have greatly reduced water flows of the Alwand River, and the construction of the Daryan Dam located on the Sirwan River in Kermanshah Province of Iran will significantly affect water flows to Halabjah Governorate in the Kurdistan Region of Iraq" . It further warns that "The Daryan Dam, which is expected to be completed in 2018, is predicted to reduce the water flows of the Sirwan River by up to 60 percent, which will affect hundreds of thousands of people in the Sulaymaniyah and Halabjah Governorates. Diminishing flows of rivers will cause a drinking water crisis and will heavily effect the agricultural, hydroelectric power and fishing sectors in the Kurdistan Region" . It highlights that the reduced water flows of the Sirwan River, known as the Diyala River in Iraq, will also have significant negative impacts on people and communities further downstream in Central and Southern Iraq. "According to statistics, more than 3,200 hectares of agricultural land in the areas of Halabjah, Sayyid Sadiq and Darbandikhan will be lost if water flows from Iran further decrease. According to KRG Member of Parliament Abdul-Rahman Ali, other small dams have been built by Iran on rivers that flow into to the Darbandikhan Dam in the KRI. With the completion of the Daryan Dam, the cities and villages of Halabjah, Sirwan, Said Sadiq and Darbandikhan will not only face water crises in the agricultural, hydroelectric power and fishing sectors, but also when it comes to drinking water." . The report also warns about possible negative impact on the peaceful coexistence between the religious groups of the region, especially since water in Iran, a Shia Muslim area, will be withheld from the KRI, a Sunni Muslim area. addition, only 9.5 km from the Daryan Dam, the Iranian government is constructing a 47 km tunnel channel, known as the Nawsud water tunnel. Construction of the dam by Iranian company Farab Co. began in 20096 and is expected to be completed in 2018. Company Names or State Enterprises FARAB Water and Energy Projects (FARAB) from Iran, Islamic Rep. The Save Kanî Bil Campaign released a statement from civil society demanding support for the strikers and actions to save the spring. In December 2015, a letter was sent to Iranian President Hassan Rouhani, signed by more than 3,000 activists and public figures. Why? Explain briefly. While there are protest, and international disputes, the project making progress. Call for collaboration on the implementation of UNESCO recommendations for the Iraqi Marshes!